Quanta Cloud Technology (QCT) launches a cutting-edge turnkey Virtual Desktop Infrastructure (VDI) Appliance powered by VMware virtualization software. It uses a 3U 9-node high density server with 2 embedded switches to create an optimized building block for your VDI deployment. Its physically isolated, multi-node architecture makes it ideal for your business continuity applications. This unique turnkey VDI appliance combines compute, storage and networking resources into a hyper-converged infrastructure with the flexibility of efficient scale-out. The QxVDI VMware Edition-OA is an exceptional, cost-effective solution that offers an outstanding user experience. Our close, collaborative relationship with VMware has produced a wealth of hyper-converged infrastructure solutions that bring the power of the software-defined data center to mutual customers of many sizes, not just the hyperscale players. Customers reap the rewards of this collaboration, with new solutions optimized for different applications, workloads and business objectives. 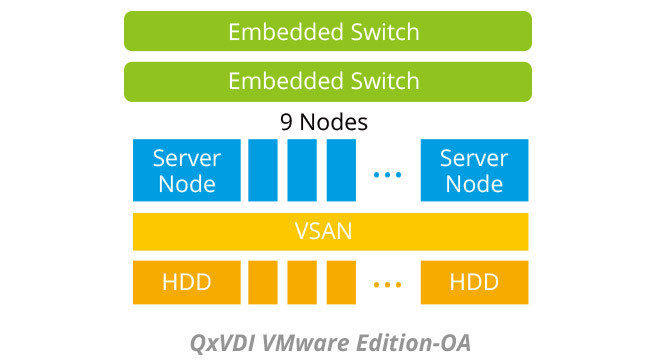 The QxVDI VMware Edition-OA is a next-generation hyper-converged infrastructure solution. By combining compute, storage, and networking in a 3U 9-node turnkey VDI appliance, it dramatically reduces OPEX and improves your user experience. The QxVDI VMware Edition-OA provides the capabilities of compute, storage, and networking resources serving as a common pool and provides pay-as-you-grow agility to your VDI deployment. It resolves the issue of multiple vendors by simply increasing the number of appliances and making the scale-out approach more flexible. Unlike traditional VDI architecture, QxVDI VMware Edition-OA ensures the continuity of your business activity. If one node fails, the failure node will automatically reallocate itself to the other working nodes and proceed with their workloads. With a high-density design, the remaining working nodes will only slightly increase its loading, which is a proven practice of achieving risk management. 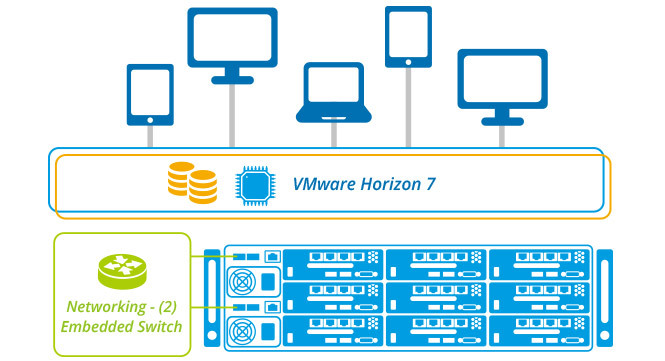 QCT delivers a pre-validated plug-and-play VDI solution with VMware Horizon. The QxVDI VMware Edition-OA uses a high-density server to resolve delay in traditional VDI architecture and greatly increase IOPS to ensure both high performance and high reliability. This 3U 9-node VDI appliance powered by pre-installed VMware Horizon has the capability to support up to 180 users. By integrating QCT Auto Deployment Manager, and leading virtualization software from VMware into this QCT-validated system, VDI implementation is simplified and can be completed in merely a few steps. HDD: (27) 1.2TB SAS 2.5"